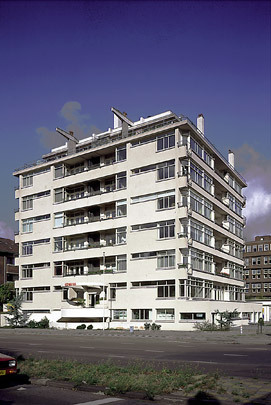 With its swish service apartments Nirwana was Holland's first tower block. It was also the first Dutch high-rise to have a concrete frame which allowed for unbroken bands of fenestration. Nirwana was to have been one of a series of interlinked apartment buildings. Projecting balconies on its western corner constitute a step in that direction. The building was renovated in 1992.